It was with great curiosity and excitement that I took the flight from Copenhagen to Stockholm to join most of the DIMECCE team on a short fieldtrip to survey the Swedish multicultural reality – ‘multicultural’ being a commonly accepted term for the existence of ethnic, religious and linguistic diversity in Sweden. Arriving on Friday, 14th of March, we were asked by Marta, who is leading the Swedish case, to be ready Saturday morning to be picked up by Danielle, the Swedish research assistant at the project. Driving a rented car, Danielle brought us safely around Södertälje and Stockholm for the following two days. Saturday morning we headed towards Södertälje, an industrial city and municipality around 30 kilometers from Stockholm. On the municipality’s website, the city calls itself “the international capital of Sweden” and by that it refers to the fact that 44% of the population has a foreign background and 80 different languages are spoken in Södertälje. (i) For the DIMECCE research project, Södertälje forms a unique and extremely interesting field site due to the huge number of Assyrians/Syriacs there and many active churches. A full account of all the churches we passed or visited, of the open house visit at a new Assyrian school, of the football match between Assyriska FF and IK Sirius that we watched, as well as of other more profane events – such as lunch at an Assyrian-owned pizzeria – would make me have to write a very long entry. Instead I want to highlight a few of our experiences while also trying to elaborate some of the potential analytical implications. The most overwhelming experience was the number of churches built or owned by different denominations of Middle Eastern origin. In person, we visited amongst others: S:T Afrem Syrianska Ortodoxa Kyrkan (St. Aphrem Syriac Orthodox Church), S:T Gabriel Syrisk Ortodoxa Kyrkan (St. Gabriel Syriac Orthodox Church), Mar Mina Koptisk-Ortodoxa Kyrkan (Mar Mina Coptic Orthodox Church), the Chaldean Johanneskyrkan (St. John Church), S:T Jacob av Nsibin Syrisk Ortodoxa Katedral (St. Jacob of Nsibin Syriac Orthodox Cathedral), S:ta Maria Syrisk Ortodoxa Kyrkan (St. Maria Syriac Orthodox Church). (ii) While driving around, we saw even more churches from the outside but simply did not have the time to visit all of them. From the left: Mar Mina Coptic Orthodox Church, St. Jacob of Nsibin Syriac Orthodox Cathedral, and St. Maria Syriac Orthodox Church (photos by Lise Galal). The majority of the churches belong to Assyrians/Syriacs. Assyrians/Syriacs are the dominant group(s) with a Middle Eastern background in Södertälje. They are not only dominating church life, but also businesses and football – the town holds two successful teams named Assyriska FF and Syrianska FC. Although Södertälje is unique (also in a Swedish context), it is interesting vis-à-vis the Danish and British reality due to the large number of Middle Eastern Christians there. 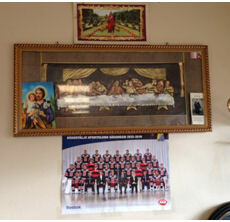 While eating our lunch, I noticed the decorations inside the pizzeria with pictures with Christian motifs, the Christian Cross and other symbols and wondered if a similar decoration in a Danish context would lead to harassment from some fellow immigrant groups with a Muslim background. Alistair from the UK-team described this dynamic succinctly: in Södertälje Middle Eastern Christians are the majority within the minority, while Middle Eastern Christians in the Danish and British context are more likely to be a minority within the minority. The strong church communities form very active communities with different kinds of activities. Thus when visiting Mar Mina Coptic Orthodox Church, we watched the choir practicing and took part in a planning meeting for upcoming activities for the youth group. After attending the Sunday service in a very full St. Jacob of Nsibin Syriac Orthodox Cathedral, we observed an annual meeting of Syriac Orthodox Youth Association (Stockholm regional branch). By going from one church group to another, it became clear that not only are these – not surprisingly – partly formed on the basis of ethnic background, but also they are big enough to be independent from other churches. It raises the question of the degree to which there is contact and collaboration between the different religious communities including the Church of Sweden. While the first encounter with other Christians in a Danish context for many immigrants will be the Danish Lutheran Church or churches of denominations different to the immigrant’s own, in Sweden, or at least in the Stockholm and Södertälje area, you might more easily find your own church. Another observation was the language choices among the different communities. While the regional board in St. Jacob of Nsibin Syriac Orthodox Cathedral was speaking Swedish during the full meeting, the group in Mar Mina Coptic Orthodox Church was speaking Arabic. Again it becomes interesting to see how language choices are made by our different case communities in church services and activities. At this stage of our research we are already able to state that our case communities do not necessarily have similar language choices in the three countries when it comes to using the language of the country of residence or the language of origin. However, by looking at the display of books available in St. Jacob of Nsibin Syriac Orthodox Cathedral, clearly many languages play a role in the community. For example, we observed ‘The Little Prince’ in Aramaic, a book by the late Coptic Orthodox Patriarch Shenouda translated into Swedish, and an introduction to classical Aramaic, as well as the Bible in different translations. 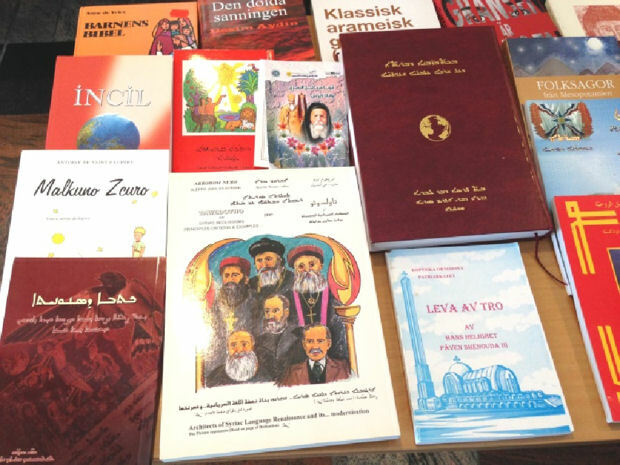 Books in Swedish, Aramaic and other languages (photo by Lise Galal). At the book display I talked with two younger men. One of them told me that he was of Assyrian background, but didn’t know much about his heritage. He came to the Church that Sunday to get to know more about his identity, as he phrased it. Hence, he also pointed to a key function of the rich church communities in Södertälje as places not only for worship, but also for identity formation and access to language and cultural practices different from the Swedish majority. As a fieldtrip, I have found this trip to Södertälje and Stockholm to be extremely relevant and successful. 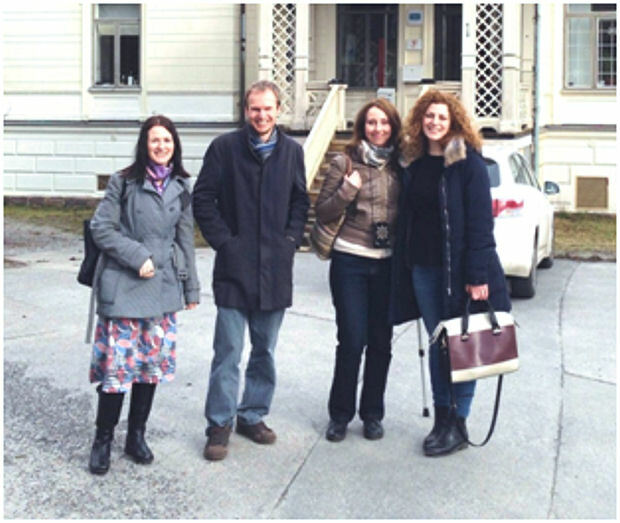 By visiting another context, it has been – as expected – possible to raise new questions about the fieldwork ‘at home’. As a project group trip it was just as successful. We had the chance to share our surprise over specific aspects as well as preliminary analytical ideas. Seen in the perspective of the comparative aspects of the DIMECCE project, I am sure this field visit and the next to come will show their value in future analyses. (ii) Naming is important, and I have chosen to translate the churches’ names into ‘Syriac’ although most of the churches in Swedish use the equivalent to ‘Syrian’. Officially, the Church has decided on the name ‘Syriac Orthodox Church of Antioch’, yet the church itself seems to shift between using Syriac and Syrian (see e.g. http://www.syrianorthodoxchurch.org/).